Get the inside scoop on the 2014 Blackjack Ball, including the answers to the test questions taken by the blackjack pros. Eight-deck games are proliferating and we have the strategies to beat them courtesy of Bill "The GameMasters" Channels. We have several blackjack reports this month that include two North Las Vegas casinos (Texas Station and Fiesta Rancho); two casinos located on Tropicana Ave. at the South end of the Strip (Excalibur and NY-NY by KC Brooks); and two located in Tucson, AZ (Casino Del Sol, Desert Diamond Airport by JPB). 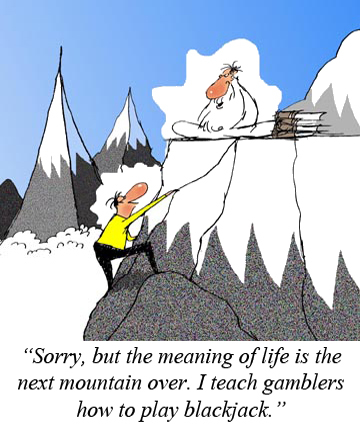 Learn how to get a better craps game than advertised from Frank Scoblete, and if you don't know what to say or do when a casino employee asks you for your social security card or number, read Jean Scott's article for the answers. Jerry "Stickman" continues his review of short-pay deuces wild games, this month for the game known as "loose deuces." Lastly, we have a summary of major blackjack tournaments courtesy of blackjacktournaments.com. I've known Channels for nearly 45 years and he is the real deal. 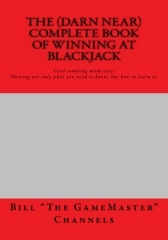 I like his book because it's arranged as a series of lessons with plenty of practice exercises that help the reader master the techniques to beat blackjack. If you want to learn how to win, I highly recommend his book. For more information, or to order, click here. This article, which appeared in issue #156 of BJI, is a great primer on understanding the risks involved when you play blackjack. "Read all about the competition for the "World's Greatest Blackjack Player," including the answers to the test questions..."
"Learn the strategies to beat the eight-deck game from Bill "The GameMaster" Channels..."
"Most visitors and locals alike are familiar with the Las Vegas Strip; however, there's another 'Strip' in the Las Vegas Valley. It's the Rancho Strip. For this month's issue of Blackjack Insider, I visited two casinos on the Rancho Strip owned and operated by Station Casinos Inc..."
"This month, I continue my review of casinos located at the south end of the Strip on or near Tropicana Ave. The two under the microscope this month are Excalibur and New York-New York casinos, both MGM properties..."
"It's been several years since I played blackjack in Tucson; in fact, at one time Tucson had some of the best blackjack games in the country. Here's what I discovered on my recent trip there..."
"The concept I am writing about, dealing with what was coined by the Captain as pushing the house, meaning literally 'pushing the casino' to give you a better game than advertised. This is how to do it..."
"The horror stories pour in when the subject of Social Security numbers and casinos is brought up on Internet gambling forums. Here's a sample of three recent postings..."
STICKMAN'S STANCE: Strategies for Loose Deuces Wild by Jerry "Stickman"
"This month I'll continue my review of deuces wild games, with three variations of the game known as 'loose deuces'..."